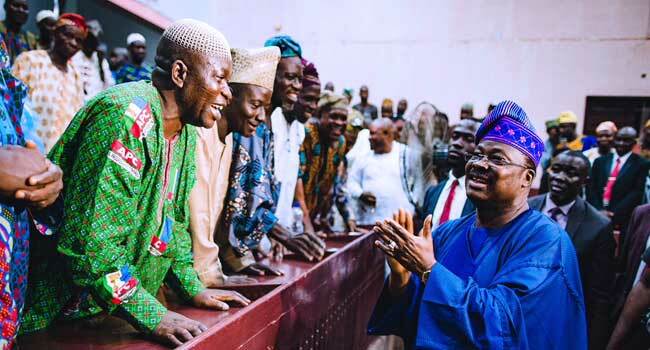 Oyo State Governor Abiola Ajimobi has directed butchers in the 11 Local Governments in Ibadan, the Oyo State capital to relocate to the newly built multi-billion naira central abattoir. The abattoir is located in Amosun village, Akinyele Local Government, Ibadan. The governor said the butchers must relocate, latest by the end of April. He gave the directive during a stakeholders’ meeting held at the House of Chiefs, Secretariat, Ibadan over the weekend. The Butchers Association was led to the meeting by the Southwest Coordinator, Alhaji Biliaminu Elesinmeta; and the State Chairman, Alhaji Azeez Alagunfon. Apart from its state-of-the-art facilities that would promote the hygiene of the consumers of meat, the governor said the new abattoir is capable of ending the incessant clashes between herders and farmers. Ajimobi explained that the abattoir was a joint venture among a private establishment, C & E Consulting Limited, the state government, the 11 LGs and 14 Local Council Development Areas in Ibadanland, as well as the butchers. He stressed that the private partners would have 50 percent share; the LGs and LCDAs would have 36 percent; state government, 10 percent; while the butchers would have four percent in the ownership structure. “We are sure that the crisis between the farmers and herdsmen will not arise again, because cows will now be transported here directly instead of our towns and villages where grazing on farmlands had been generating tension. “I’m also happy that this arrangement will bring about a change in the way butchers handle meat and it will improve the hygiene of the business. The facility is going to have health and sanitary officers that will ensure strict compliance with the basic hygiene of meat handling,” Governor Ajimobi said. He added that the state had entered into an agreement with the private investors to use the facility for 30 years, after which the total ownership would be transferred to the butchers. Ajimobi appealed for support and understanding of the butchers to comply with the relocation order, on the premise that the facility had suffered neglect for too long due to unresolved issues among the stakeholders. The leaders of the butchers expressed gratitude to the governor for allaying their fears about the project, and for the support of the government to the association in the area of financial empowerment and donation of a new bus to members.